The Potty Patch is a new product presented by the American Kennel Club (AKC) to help owners in search of an indoor solution to their pet's house training needs. Learn more about this innovative product from a veterinarian's point of view. Dr. Chris Hallihan is a 1995 graduate of the University of Pennsylvania School of Veterinary Medicine. With his wife, fellow veterinarian Dr. Kristen Casulli, he owns and operates Animal Care Centers in Flanders, New Jersey. Dr. Hallihan agreed to speak with LoveToKnow about the Potty Patch and share his opinion of the product as well as offer a few pointers about using it. LoveToKnow (LTK): Dr. Hallihan, What exactly is the Potty Patch? Dr. Chris Hallihan (Dr. H.): This is a revolutionary indoor bathroom for dogs. Many veterinarians say this is a "must-have" product for dog owners. They allow dogs to relieve themselves instead of holding it when their owner is unable to make it home to let them out at the designated times. So, the dog doesn't have to feel added discomfort. This unit is also very convenient for those unfortunate times when your companion is hurt. Vets usually recommend limited activity and more rest after surgery or when your dog has wounded paws. The Patch is a great option in these situations. It is also a great option for hazardous weather conditions when it is unsafe to take your dog outside. LTK: People have used litter boxes for cats for quite some time. Do you think dog owners are ready to embrace this house breaking aid? Dr. H.: Yes, I think they are. I feel it will be a great benefit for people or pets who have a difficult time getting outside due to medical conditions of the owner or the pet, such as arthritis or heart disease. The unit is also very convenient in times of inclement weather. Also, many people live in apartments, and it is difficult to make it outside in time for your pet, especially when you're first house training a new puppy. LTK: How does this system work? 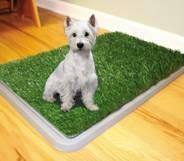 Dr. H.:The Potty Patch is a three-tiered doggie restroom. The top portion is made of a soft artificial grass specifically designed to let liquid flow through. The collection tray holds up to one gallon of liquid, so it allows multiple uses. The Patch feels natural because of the synthetic grass, and it is a great solution when there is inclement weather or as emergency backup for dogs. LTK: How do you clean the unit? Dr. H.: It's very easy to clean with hot, soapy water. The synthetic grass is easily removed from the two parts of the base to clean the parts separately. LTK: Is the Patch suitable for dogs of all sizes? LTK: How do you train a dog to use the Patch? Dr. H.: Training a dog to use the Patch is similar to how you would train a dog to go outside. Place your dog on the patch when he gives signals that he may need to go to the bathroom (whining, sniffing around, becoming restless) or after he eats. Be patient, and give positive reinforcement when the dog successfully uses the Patch. This includes offering him treats or verbal praise. Be prepared for the dog not using the Patch on the first try or needing to be guided to it. However, once he makes the connection that using the Patch leads to positive feedback from his owners, he'll quickly get the idea! LTK: Many dog owners who have problems with their pet's house soiling might think of turning to a unit like this. Can you offer some advice beyond basic training that might help? Dr. H.: You need to be patient and very attuned to your dog's need to go to the bathroom. Many dogs won't bark to go out, especially at the beginning of training, so you need to always watch them for subtle signs of discomfort or a need to go to the bathroom. I recommend attaching your dog to you with a 10-foot lead so he can't wander away and house soil when you're not paying attention. Using this technique, take your dog to the Patch at the first sign of sniffing around, restlessness or whining. Remember to offer positive reinforcement when your dog uses the Patch. Also, remember that the only time you can use verbal-only negative reinforcement is if you actually catch your dog in the act of house soiling. Do not drag your pet over to an accident you found after the fact and yell at him because he will not make the connection. Doing so can actually make house training more difficult since your pet could become afraid to go to the bathroom in your presence. LTK: Can a dog be trained to use the Patch when necessary yet still be trained to go outside when the opportunity is offered? Or, is it better to stick with one way or the other? Dr. H.: Yes, a dog can be trained to use the Patch indoors as well as still go outside since the synthetic grass mimics the way real grass smells and feels. Dogs develop a "substrate preference", which means they learn to like to go to the bathroom on a certain surface. Grass seems to be a natural preference for dogs, and the Potty Patch is similar to grass, so it is easy to switch back and forth between the two surfaces. LTK: Where can people find the Potty Patch? Dr. H.: It is available at all PETCO and PetSmart locations or online at PottyPatch.com for $39.99. Dr. H.: I feel the Potty Patch is a great addition to house training new puppies, and it can be a potential lifesaver for older or debilitated dogs who just can't get outside anymore. It does not replace positive reinforcement and good house training techniques (In other words, it won't train your dog for you! ), but it certainly helps a great deal in situations when going outside is difficult for the owner or the pet. Many thanks to Dr. Hallihan for taking time to discuss the Potty Patch and offer tips about training dogs to use it. You can decide for your yourself if this product might prove useful in your own household.